Written for all courses in digital electronics—from introductory to advanced, from high school to two- and four-year college programs—this Twelfth Edition of Digital Systems thoroughly prepares students for the study of digital systems and computer and microcontroller hardware. The text begins with the basics of digital systems, including the AHDL hardware description language, then gradually progresses to increasingly challenging topics, including the more complex VHDL. The text is comprehensive yet highly readable, clearly introducing the purpose and fundamentals of each topic before delving into more technical descriptions. It is also definition-focused, with new terms listed in each chapter and defined in a glossary. This Twelfth Edition has been thoroughly revised and updated with new material on section-level learning outcomes, Quadrature Shaft Encoders used to obtain absolute shaft positions, troubleshooting prototype circuits using systematic fault isolation techniques, Time Division Multiplexing, expanded discussion of VHDL data objects and more! Ron Tocci is a retired Professor Emeritus of Electrical Engineering Technology from Monroe Community College in Rochester, New York, where he served on the faculty and as department chair for many years. He is an accomplished author with very successful titles in electronic devices, microprocessors, and, of course, Digital Systems, which he originally published in 1980. Neal Widmer has been teaching digital electronics for over 30 years. He holds a Bachelor’s Degree in Electrical Engineering Technology and a Master’s Degree in Industrial Engineering, both from Purdue University. Prior to teaching, his professional practice was in clinical engineering departments of two Midwest hospitals. Currently, he is a Full Professor and Associate Department Head in the School of Engineering Technology at Purdue University, teaching concurrent digital systems and advising senior capstone design projects, in addition to his administrative duties. He was co-author of Electronic Troubleshooting from McGraw Hill, most recently published in 2004. In 1992, he was invited to join Ron Tocci in producing the Sixth Edition of this text. Greg Moss is a retired Professor Emeritus of Electrical Engineering Technology from Purdue University, where he taught digital electronics for over thirty years. 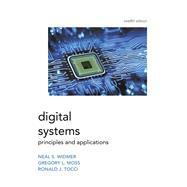 He was the sole author of the design-oriented lab manual that accompanied Digital Systems for many years, and has co-authored this text since the Tenth Edition.